How do I get a provisional licence? How long will it take me to pass? Learning to drive isn´t just about passing the driving test, it´s about safe driving for life. It is important therefore that you get the best possible driving tuition that is going to equip you with all the skills necessary to ensure you are safe on the roads long after you have passed your driving test. The pink coloured licence shows that the driving instructor is a trainee instructor. This means that they are currently being trained by an organisation and they have reached a level where they are able to teach students professionally. The green coloured licence means that the driving instructor has passed their final exam and is a fully approved driving instructor. They will receive regular check tests from the DVSA to ensure that their quality of teaching is still of a high standard. There's no such thing as a free ride! The amount you pay your driving instructor forms his wage. He's self-employed and doesn't get any more income from the driving school he works for. The cost of owning a car, including insurance and fuel is at an all time high and driving instructors are not immune to this. If you can get 10 lessons for under £100 or 5 lessons for under £60 then there may well be a catch, you may be committed to doing a certain number of driving lessons to qualify or some of those driving lessons may be held back, the standard hourly lesson prices may be quite high once the offer has expired and the driving instructor may have to keep you learning to drive for that little bit longer so that he or she can earn some money. So make sure you know the full story and read the small print first. Linked to the price of the driving lesson, make sure you know how much driving you are getting for your money. Sometimes a driving lesson does not mean an hour's drive. So you may end up paying more for the driving lesson and not get what you were expecting from it. You're paying to have your driving instructor's undivided attention for the duration of your driving lesson. You should not have to spend 10-15 minutes of your driving lesson taking your driving instructor's previous student home! Ask yourself, when was the last time your driving instructor took a break from teaching? If he goes from one student to the next then he has no down time, eventually he will get tired and quite stressed meaning that his quality of teaching will get poorer as the day goes on. As above, you are paying your driving instructor for his time for the duration of your driving lesson time. You should not be running personal errands for him such as stopping at Drive Thrus' for drinks, picking up lunch, and whilst filling the car up with fuel is an important thing to do, even this should not be done on your driving lesson time more than once! From 1st December 2003 it is an offence to use a hand-held mobile phone whilst driving or whilst supervising a learner driver. This legislation applies at all times when the vehicle's engine is running. So even if you have pulled over or are parked up with the engine on, you are still liable for prosecution if you use a hand-held mobile phone. Your driving instructor, therefore, should not be using his mobile phone during teaching time – it is an offence to do so. When in a car your proximity to the person in the passenger seat is quite close and so you need to feel comfortable with the driving instructor you choose. Only in emergency situations should a driving instructor be excused for touching you i.e. going for the steering wheel and touching your hand. Your driving instructor should have a professional relationship with you and so they should be appropriately dressed for teaching and act professionally at all times. Driving instructors have no reason to enter your house or to ask you to meet in a social environment unless requested by you. You need to have a good working relationship with your driving instructor. Remember you are learning to drive and your driving instructor should be patient with you. If you are constantly being shouted at or sworn at by your driving instructor then you should be looking to change instructor. You should not dread going on a driving lesson or fear your driving instructor, learning to drive should be a fun and memorable experience for all the right reasons. At Ignition Driving School we feel so strongly about being professional and providing high quality tuition, that we make all our instructors sign our code of conduct when they join the school. Ensure that all driving lessons given conform to the DVSA recommendations. Ensure that at all times the tuition vehicle is in a roadworthy and appropriate condition for teaching, that it is maintained in accordance with the manufacturer's recommendations and that it receives all required scheduled servicing. Ensure that the tuition vehicle is kept clean and tidy at all times. IDS driving instructors must dress appropriately. Smart but casual wear is acceptable, however tracksuits, shorts, mini-skirts and any other inappropriate dress will not be accepted. Use of mobile phones whilst teaching is strictly forbidden, except under exceptional circumstances. Mobile phones must be kept on silent during the duration of the lesson. Smoking inside the tuition vehicle during teaching hours is strictly forbidden. Smoking breaks must be taken outside of the car. Personal errands must be done outside of teaching time. Physical contact with a pupil is strictly forbidden except in emergency situations i.e. grabbing the steering wheel from a pupil to avoid an accident. Aggressive behaviour, whether physical or verbal, towards a pupil, member of DVSA staff or IDS instructor will not be tolerated. No passengers are allowed in the tuition car during teaching time, with the exception of interpreters, DVSA officials and representatives of IDS. IDS instructors must be medically and physically fit to teach - if the lesson is essential then contact an IDS instructor and arrange for them to take the lesson instead. As a self employed IDS driving instructor you are responsible for getting to your pupils on time. Should you be delayed by more than 10 minutes, you should contact your pupil as soon as possible. Before you start having professional driving lessons you need to be 17 years of age and have a provisional driving licence. A provisional driving licence costs £50 and application forms (D1 and D750) can be obtained either from the post office or the DVLA. Whilst you need to be 17 years of age to start learning to drive you can obtain a provisional licence up to 3 months before your birthday so that you're ready to go once your party celebrations are over! We often get asked how many driving lessons will I need to be at driving test standard? Everybody is different and you'll know when you're ready when you're driving confidently and safely with little or no help from your driving instructor. According to the Driver and Vehicle Standards Agency (DVSA), who set the driving test, "those who pass their driving test have had, on average, about 45 hours of professional training, combined with 22 hours of private practice. Candidates who combine professional instruction with private practice are also more successful on the test." Taking more driving lessons in a week: This will help you retain the information already learned. Taking driving lessons consistently: Having large gaps between lessons will mean having to relearn certain subjects. Having private practice: Not only will this allow you to practice the areas in which you are weak, but it will also enable you to face more varied road situations and therefore, make you a safer driver. What is the driving test pass rate? There are two main ways of learning to drive; taking standard hourly lessons, whereby you take one or 2 driving lessons a week until you reach test standard, and taking an intensive driving course where you take several driving lessons each week so that you reach test standard quicker. If you are not in any particular rush to learn to drive or if money's a bit tight then doing an hourly lesson a week could be the better route to take. It is much better to take a steady but regular course of driving lessons than to take lots of lessons over a short time period followed by a large break before coming back to it again once you can afford it. If you have a fixed amount of money then spread the lessons out to the date you get paid again, blitzing the lessons over a week then doing nothing for several weeks could cause you to forget a lot of the information learnt and you will have to go over old ground again when you start up again. Intensive driving courses allow you to get up to test standard more quickly, and so if you have a bit of time pressure or you learn better when driving lessons are closer together, then an intensive driving course could be the right style of course for you. There are a few things you need to be aware of about intensive driving courses. An official driving test will be booked through the DVSA but they have waiting lists. It is approximately a 2 week waiting time for a theory test and approximately 4-8 weeks for a practical driving test. In some parts of the country the waiting time may be up to 3 months for a practical driving test. It is highly unlikely, therefore, that you will be able to take your theory and practical driving tests within the same week of each other as you CANNOT book a practical driving test until the theory test has been passed. Be wary of any company that says they can book you both tests within the same week, driving schools CANNOT stockpile tests and if they are using other peoples' details to book tests in advance without their knowledge, it is fraud and the DVSA takes these matters very seriously. Have a realistic expectation of when you will be ready to take your driving test. An intensive driving course does not reduce the number of driving lessons you will need to take, it simply reduces the length of time over which you will take them. The DVSA say that on average a person who has had little or no experience of driving before will need approximately 45 hours of professional driving tuition combined with approximately 22 hours worth of private practice to be at driving test standard. If you took just one hour driving lesson each week then it would take you roughly one year to be at test standard, an intensive course alternatively allows you to take several driving lessons each week thus reducing the length of learning time to reach test standard. Any driving instructor / driving school can give you intensive driving lessons. The difference is simply who books the test. If you book your own tests then you could potentially save yourself some money by working intensively with your driving instructor, most driving schools offer discounts for block booking lessons etc. If you book an intensive driving course with a company then you are also paying for the company to book and manage the tests and course and so intensive driving courses will inevitably be more expensive. If you are quite restricted or limited as to the date of your driving test then it is better to book the driving test yourself and then get a driving instructor who can help you with that test date, you may have to check the DVSAs website several times each day for cancellations if you are looking for a specific date to take your test. Some companies offer the chance to learn to drive away from home and take your driving test at the end of the same week. These courses sound appealing, you can concentrate purely on your driving and be away from all the other distractions at home. Make sure you know the full details of the intensive driving course before you book. They often cost a lot of money and you may well have to share your tuition time with other learner drivers who are in the car with you at the same time, sometimes there may be 2 other learner drivers in the car with you. So a 40 hour course that you have paid for actually translates to just over 13 driving hours and 26 hours sat in the back of the car watching other people drive! You need to also find out where you will be taking your driving test as you may not be taking your driving test in the area you have been having your driving lessons. You should be able to drive anywhere, right? So it doesn´t matter where you take your test, does it? On test day the last thing you need to worry about is the location, you should be comfortable with the test centre. Test centres across the country have different pass rates, which isn't helped by the size of the town or complexity of the junctions around that area. You may have had all your driving lessons in a small town but then take your driving test in a city – would you know how to handle tram zones? Bus lanes? Multi-laned roundabouts? Even to the most experienced of driver some junctions are incredibly difficult to negotiate in the first instance, so why put yourself in that position on the most important driving day of your life - your test day? If time is of the essence, search the DVSAs website and find yourself a cancellation test at a test centre you are familiar with, then find yourself a local instructor to that area who can work intensively towards that test date. The results will be far better! The all-inclusive course is for total beginners, who have had very little or no driving experience and who have not taken a theory test as yet. We start by booking a theory test for you at your local test centre, which will be approximately 2 weeks from the date it was booked. We also send you some course materials out to revise from so that you can be preparing for the big day. Once you have passed your theory test we would then book your practical driving test at your local test centre for a date that is best for you based on your ability and availability. The approximate waiting time for a practical driving test is currently between 4 and 6 weeks. 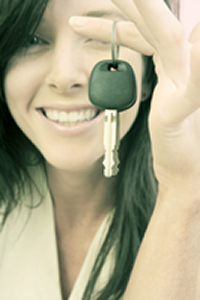 Therefore, it is possible to go from being a beginner to driving test standard within a couple of months. It is up to you how you spread the driving lessons out over the course but it is not advisable to take more than 25 hours in any one week. You'll achieve much greater success if you spread the driving lessons out and do approximately 4-5 hours' worth each week. The post theory test course is for people who have already passed their theory test but have had little or no driving experience to date. Based on your information we would book the next available practical driving test for your local driving test centre and then you simply work the driving lessons in between now and your test date. Again it is advisable to spread the driving lessons out as it gives you the flexibility to increase the number of lessons should you need to. The do it yourself course is for people who are restricted as to when they can take their practical driving test or who may already have a driving test booked. To do a DIY course, you book your driving test and then work intensively towards that test date you have booked. All intensive driving courses include the test fees and additional driving lessons and tests can be booked for you if necessary. Please note, on all courses 2 hours will be reserved for the practical driving test day itself. So if you book a 10 hour course, this equates to 8 hours of actual teaching and 2 hours for driving test day. For more information about intensive driving courses and availability in your area click here. To obtain a driving licence you will need to pass two tests: The theory and hazard perception test and the practical driving test. The Theory Test was introduced to test your knowledge of the rules of the road, and the Hazard Perception test which follows, assesses your driving awareness skills. The theory test comprises of 50 questions with between 4 and 6 possible answers. To pass this section you need to get at least 43 out of 50 correct. As of January 2012 the DVSA have stopped publishing the actual questions used for the theory test to stop candidates learning the answers by rote fashion. Remember, safe driving for life comes from understanding the rules of the road and it is important that you understand ‘why' certain rules are there. The best way to prepare for your theory test is to buy some theory books published by the DVSA. Ignition Driving School recommends The Highway Code, Driving: The Essential Skills and Know Your Traffic Signs. These books cover different aspects of the theory and can be used together to give you a good understanding of the rules of the road. You should be able to buy these publications from any good book store. The hazard perception element comprises of 14 video clips, each 1 minute long. During these clips, you will see a normal road situation, in which a hazardous event will happen and as soon as you see it, you will need to click the mouse. This part of the test is designed to test your ability to react quickly to what you see, so the quicker you spot the hazard, the more points you score. Each clip is programmed to have a window of opportunity to click and so it is worth clicking a couple of times per clip as your first click may have fallen outside of the window of opportunity. If you fail to click within the window of opportunity then you will score 0 for that clip. Likewise if you click too many times on the clip or if the program detects rhythmic clicking then you will also score 0 for that clip. There are 15 hazards to spot in total but only 14 clips, so be careful as one of the clips has 2 hazards for you to find. You need at least 44 out of a possible 75 to pass this section. You must pass both elements in order to pass your theory test overall. Learning theory however, should not just be done for the theory test – understanding the theory enhances a driver's road sense and so reading the theory can be used to help you with your practical driving test and beyond. At Ignition Driving School we can help you to prepare for your theory test. Our online pupil centre called, The Hub, allows you to practice theory papers and hazard perception clips for FREE. With over 950 theory questions, we have created an unlimited amount of theory tests with randomly selected questions from each of the 14 different sections to allow you to test your knowledge in the comfort of your own home. You can go back to questions you are unsure about also and most importantly we have included the reasons for the answers, which will help you with your understanding and knowledge. You may find that if you are constantly getting questions wrong from a particular section of the theory bank that you need to read up more on these areas. In addition to the practice theory papers we also have hazard perception clips for you to practice. Once you have passed your theory and hazard perception test, you´re on the right road to taking the practical driving test. The practical driving test will last approximately 40 minutes and is designed to cover all areas of your driving, including a reversing manoeuvre and possibly an emergency stop. You will also be tested on your ability to drive independently for approximately 20 minutes following directions from a sat nav. As part of the practical driving test you will also be asked 2 questions relating to the maintenance of the car. Remember, the driving test is your opportunity to show the driving examiner that you are ready to drive on the roads unaided for the rest of your life. You need to act responsibly, safely, respectfully of others and legally. You need to demonstrate that you have the vehicle under control at all times and that you can plan and be aware of developing situations. Make sure that you are ready to be that person before you consider taking a test. Your driving instructor can help you assess your level of ability by conducting mock driving tests. Listen to the feedback your driving instructor gives you and work with them to improve and develop further. The benefits of the course not only include increasing your perception skills but also many insurance companies offer incentives to those people who have undertaken the course. We highly recommend taking this additional course, not only because of the insurance benefits but also for the safety aspect. For example, you may have had all your driving lessons during the summer months and so had little experience of driving in the dark, and as a learner you won't have been on a motorway before. By doing the course you will be able to practice driving in these hazardous conditions with a highly trained driving instructor sitting next to you, making them less daunting when you are driving on your own in the future. We don't want you to become another statistic, so why not enquire about the Pass Plus course to your driving instructor and find out how the course can help you become a safer driver on the roads.